Concussion, also known as mild traumatic brain injury (mTBI), is typically defined as a head injury that temporarily affects brain functioning. Symptoms may include loss of consciousness (LOC); memory loss; headaches; difficulty with thinking, concentration or balance; nausea; blurred vision; sleep disturbances; and mood changes. Any of these symptoms may begin immediately, or appear days after the injury, and it is not unusual for symptoms to last four weeks. Fewer than 10% of sports-related concussions among children are associated with loss of consciousness. Common causes include motor vehicle collisions, falls, sports injuries and bicycle accidents. Risk factors include drinking alcohol. The mechanism may involve either a direct blow to the head or forces elsewhere on the body that are transmitted to the head. This is believed to result in neuron dysfunction, as there is increased glucose requirements but insufficient blood supply. Diagnosis requires less than 30 minutes of LOC, memory loss of less than 24 hours, and a Glasgow coma scale score of 13 to 15. Otherwise, it is considered a moderate or severe traumatic brain injury. Prevention of concussions includes the use of a helmet when bicycling or motorbiking. Treatment generally involves physical and cognitive rest for a day or two, with a gradual return to activities. Prolonged periods of rest may worsen outcomes. Paracetamol (acetaminophen) or NSAIDs may be recommended to help with a headache. Physiotherapy may be useful for persistent balance problems; cognitive behavioral therapy may be useful for mood changes. Evidence to support the use of hyperbaric oxygen therapy and chiropractic therapy is lacking. Concussions are estimated to affect more than 6 per 1,000 people a year. It is the most common type of TBI. Males and young adults are most commonly affected. Outcomes are generally good. Another concussion before the symptoms of a prior concussion have resolved is associated with worse outcomes. Repeated concussions may also increase the risk in later life of chronic traumatic encephalopathy, Parkinson's disease and depression. Concussions are associated with a variety of symptoms, which typically occur rapidly after the injury. Early symptoms usually subside within days or weeks. The number and type of symptoms any one individual suffer varies widely. Headaches are the most common mTBI symptom. Others include dizziness, vomiting, nausea, lack of motor coordination, difficulty balancing, or other problems with movement or sensation. Visual symptoms include light sensitivity, seeing bright lights, blurred vision, and double vision. Tinnitus, or a ringing in the ears, is also commonly reported. In one in about seventy concussions, concussive convulsions occur, but seizures that take place during or immediately after a concussion are not "post-traumatic seizures", and, unlike post-traumatic seizures, are not predictive of post-traumatic epilepsy, which requires some form of structural brain damage, not just a momentary disruption in normal brain functioning. Concussive convulsions are thought to result from temporary loss or inhibition of motor function and are not associated either with epilepsy or with more serious structural damage. They are not associated with any particular sequelae and have the same high rate of favorable outcomes as concussions without convulsions. Cognitive symptoms include confusion, disorientation, and difficulty focusing attention. Loss of consciousness may occur, but is not necessarily correlated with the severity of the concussion if it is brief. Post-traumatic amnesia, in which events following the injury cannot be recalled, is a hallmark of concussions. Confusion, another concussion hallmark, may be present immediately or may develop over several minutes. A person may repeat the same questions, be slow to respond to questions or directions, have a vacant stare, or have slurred or incoherent speech. Other MTBI symptoms include changes in sleeping patterns and difficulty with reasoning, concentrating, and performing everyday activities. A concussion can result in changes in mood including crankiness, loss of interest in favorite activities or items, tearfulness, and displays of emotion that are inappropriate to the situation. Common symptoms in concussed children include restlessness, lethargy, and irritability. Rotational force is key in a concussion. Punches in boxing can deliver more rotational force to the head than the typical impact in American football. Forces may cause linear, rotational, or angular movement of the brain or a combination of them. In rotational movement, the head turns around its center of gravity and in angular movement, it turns on an axis, not through its center of gravity. The amount of rotational force is thought to be the major component in concussion and its severity. Studies with athletes have shown that the amount of force and the location of the impact are not necessarily correlated with the severity of the concussion or its symptoms, and have called into question the threshold for concussion previously thought to exist at around 70–75 g.
The parts of the brain most affected by rotational forces are the midbrain and diencephalon. It is thought that the forces from the injury disrupt the normal cellular activities in the reticular activating system located in these areas and that this disruption produces the loss of consciousness often seen in concussion. Other areas of the brain that may be affected include the upper part of the brain stem, the fornix, the corpus callosum, the temporal lobe, and the frontal lobe. Angular accelerations of 4600, 5900, or 7900 rad/s2 are estimated to have 25, 50, or 80% risk of MTBI respectively. Concussion involves diffuse (as opposed to focal) brain injury, meaning that the dysfunction occurs over a widespread area of the brain rather than in a particular spot. It is thought to be a milder type of diffuse axonal injury, because axons may be injured to a minor extent due to stretching. Animal studies in which rodents were concussed have revealed lifelong neuropathological consequences such as ongoing axonal degeneration and neuroinflammation in subcortical white matter tracts. Axonal damage has been found in the brains of concussion sufferers who died from other causes, but inadequate blood flow to the brain due to other injuries may have contributed. Findings from a study of the brains of deceased NFL athletes who received concussions suggest that lasting damage is done by such injuries. This damage, the severity of which increases with the cumulative number of concussions sustained, can lead to a variety of other health issues. In summary, and extrapolating from animal studies, the pathology of a concussion seems to start with the disruption of the cell membrane of nerve cells. This results in a migration of potassium from within the cell into the extracellular space with the subsequent release of glutamate which potentiates further potassium shift, in turn resulting in depolarization and suppression of nerve activity. In an effort to restore ion balance, the sodium-potassium ion pumps increase activity, which results in excessive ATP (adenosine triphosphate) consumption and glucose utilization. Lactate accumulates but, paradoxically, cerebral blood flow decreases, which leads to a proposed "energy crisis." After this increase in glucose metabolism, there is a subsequent lower metabolic state which may persist for up to 4 weeks after injury. A completely separate pathway involves a large amount of calcium accumulating in cells, which may impair oxidative metabolism and begin further biochemical pathways that result in cell death. Again, both of these main pathways have been established from animal studies and the extent to which they apply to humans is still somewhat unclear. Unequal pupil size can be a sign of a brain injury possibly more serious than a concussion. Head trauma recipients are initially assessed to exclude a more severe emergency such as an intracranial hemorrhage. This includes the "ABCs" (airway, breathing, circulation) and stabilization of the cervical spine which is assumed to be injured in any athlete who is found to be unconscious after head or neck injury. Indications that screening for more serious injury is needed include worsening of symptoms such as headaches, persistent vomiting, increasing disorientation or a deteriorating level of consciousness, seizures, and unequal pupil size. Those with such symptoms, or those who are at higher risk of a more serious brain injury, may undergo brain imaging to detect lesions and are frequently observed for 24–48 hours. A brain CT or brain MRI should be avoided unless there are progressive neurological symptoms, focal neurological findings or concern of skull fracture on exam. Diagnosis of MTBI is based on physical and neurological examination findings, duration of unconsciousness (usually less than 30 minutes) and post-traumatic amnesia (PTA; usually less than 24 hours), and the Glasgow Coma Scale (MTBI sufferers have scores of 13 to 15). Neuropsychological tests exist to measure cognitive function and the international consensus meeting in Zurich recommended the use of the SCAT2 test. Such tests may be administered hours, days, or weeks after the injury, or at different times to demonstrate any trend. Increasingly, athletes are also being tested pre-season to provide a baseline for comparison in the event of an injury, though this may not reduce risk or affect return to play. If the Glasgow Coma Scale is less than 15 at two hours or less than 14 at any time, a CT is recommended. In addition, a CT scan is more likely to be performed if observation after discharge is not assured or intoxication is present, there is suspected increased risk for bleeding, age greater than 60, or less than 16. Most concussions, without complication, cannot be detected with MRI or CT scans. However, changes have been reported on MRI and SPECT imaging in those with concussion and normal CT scans, and post-concussion syndrome may be associated with abnormalities visible on SPECT and PET scans. Mild head injury may or may not produce abnormal EEG readings. A blood test known as the Brain Trauma Indicator was approved in the United States in 2018 and may be able to rule out the risk of intracranial bleeding and thus the need for a CT scan. Concussion falls under the classification of mild TBI, but it is not clear whether concussion is implied in mild brain injury or mild head injury. [needs update] "MTBI" and "concussion" are often treated as synonyms in medical literature but other injuries such as intracranial hemorrhages (e.g. intra-axial hematoma, epidural hematoma, and subdural hematoma) are not necessarily precluded in MTBI or mild head injury, as they are in concussion. MTBI associated with abnormal neuroimaging may be considered "complicated MTBI". "Concussion" can be considered to imply a state in which brain function is temporarily impaired and "MTBI" to imply a pathophysiological state, but in practice, few researchers and clinicians distinguish between the terms. Descriptions of the condition, including the severity and the area of the brain affected, are now used more often than "concussion" in clinical neurology. At least 41 systems measure the severity, or grade, of a mild head injury, and there is little agreement about which is best. In an effort to simplify, the 2nd International Conference on Concussion in Sport, meeting in Prague in 2004, decided that these systems should be abandoned in favor of a 'simple' or 'complex' classification. However, the 2008 meeting in Zurich abandoned the simple versus complex terminology, although the participants did agree to keep the concept that most (80–90%) concussions resolve in a short period (7–10 days) and although the recovery time frame may be longer in children and adolescents. Protective equipment such as headgear has been found to reduce the number of concussions in athletes and improvements in the design of helmets may decrease the number and severity further. New "Head Impact Telemetry System" technology is being placed in helmets to study injury mechanisms and may generate knowledge that will potentially help reduce the risk of concussions among American Football players. Self-reported concussion rates among U-20 and elite rugby union players in Ireland are 45–48%. Half of these injuries go unreported. Changes to the rules or enforcing existing rules in sports, such as those against "head-down tackling", or "spearing", which is associated with a high injury rate, may also prevent concussions. Only when symptom-free for 24 hours, should progression to the next step occur. If symptoms occur, the person should drop back to the previous asymptomatic level for at least another 24 hours. The emphasis is on remaining symptom-free and taking it in medium steps, not on the steps themselves. Medications may be prescribed to treat sleep problems and depression. Analgesics such as ibuprofen can be taken for headaches, but paracetamol (acetaminophen) is preferred to minimize the risk of intracranial hemorrhage. Concussed individuals are advised not to use alcohol or other drugs that have not been approved by a doctor as they can impede healing. Activation database-guided EEG biofeedback has been shown to return the memory abilities of the concussed individual to levels better than the control group. People may be released after assessment from hospital or emergency room to the care of a trusted person with instructions to return if they display worsening symptoms or those that might indicate an emergent condition such as change in consciousness, convulsions, severe headache, extremity weakness, vomiting, new bleeding or deafness in either or both ears. MTBI has a mortality rate of almost zero. The symptoms of most concussions resolve within weeks, but problems may persist. These are seldom permanent, and the outcome is usually excellent. About 75% of children recover within three months. The overall prognosis for recovery may be influenced by a variety of factors that include age at the time of injury, intellectual abilities, family environment, social support system, occupational status, coping strategies, and financial circumstances. People over age 55 may take longer to heal from MTBI or may heal incompletely. Similarly, factors such as a previous head injury or a coexisting medical condition have been found to predict longer-lasting post-concussion symptoms. Other factors that may lengthen recovery time after MTBI include psychological problems such as substance abuse or clinical depression, poor health before the injury or additional injuries sustained during it, and life stress. Longer periods of amnesia or loss of consciousness immediately after the injury may indicate longer recovery times from residual symptoms. For unknown reasons, having had one concussion significantly increases a person's risk of having another. Having previously sustained a sports concussion has been found to be a strong factor increasing the likelihood of a concussion in the future. Other strong factors include participation in a contact sport and body mass size. The prognosis may differ between concussed adults and children; little research has been done on concussion in the pediatric population, but concern exists that severe concussions could interfere with brain development in children. In post-concussion syndrome, symptoms do not resolve for weeks, months, or years after a concussion, and may occasionally be permanent. About 10% to 20% of people have post-concussion syndrome for more than a month. Symptoms may include headaches, dizziness, fatigue, anxiety, memory and attention problems, sleep problems, and irritability. There is no established treatment, and rest, a recommended recovery technique, has limited effectiveness. Symptoms usually go away on their own within months but may last for years. The question of whether the syndrome is due to structural damage or other factors such as psychological ones, or a combination of these, has long been the subject of debate. Cumulative effects of concussions are poorly understood, especially the effects on children. The severity of concussions and their symptoms may worsen with successive injuries, even if a subsequent injury occurs months or years after an initial one. Symptoms may be more severe and changes in neurophysiology can occur with the third and subsequent concussions. Studies have had conflicting findings on whether athletes have longer recovery times after repeat concussions and whether cumulative effects such as impairment in cognition and memory occur. Chronic traumatic encephalopathy, or "CTE", is an example of the cumulative damage that can occur as the result of multiple concussions or less severe blows to the head. The condition was previously referred to as "dementia pugilistica", or "punch drunk" syndrome, as it was first noted in boxers. The disease can lead to cognitive and physical handicaps such as parkinsonism, speech and memory problems, slowed mental processing, tremor, depression, and inappropriate behavior. It shares features with Alzheimer's disease. Second-impact syndrome, in which the brain swells dangerously after a minor blow, may occur in very rare cases. The condition may develop in people who receive second blow days or weeks after an initial concussion before its symptoms have gone away. No one is certain of the cause of this often fatal complication, but it is commonly thought that the swelling occurs because the brain's arterioles lose the ability to regulate their diameter, causing a loss of control over cerebral blood flow. As the brain swells, intracranial pressure rapidly rises. The brain can herniate, and the brain stem can fail within five minutes. Except in boxing, all cases have occurred in athletes under age 20. Due to the very small number of documented cases, the diagnosis is controversial, and doubt exists about its validity. A 2010 Pediatrics review article stated that there is debate whether the brain swelling is due to two separate hits or to just one hit, but in either case, catastrophic football head injuries are three times more likely in high school athletes than in college athletes. Most cases of traumatic brain injury are concussions. A World Health Organization (WHO) study estimated that between 70 and 90% of head injuries that receive treatment are mild. However, due to underreporting and to the widely varying definitions of concussion and MTBI, it is difficult to estimate how common the condition is. Estimates of the incidence of concussion may be artificially low, for example, due to underreporting. At least 25% of MTBI sufferers fail to get assessed by a medical professional. The WHO group reviewed studies on the epidemiology of MTBI and found a hospital treatment rate of 1–3 per 1000 people, but since not all concussions are treated in hospitals, they estimated that the rate per year in the general population is over 6 per 1000 people. 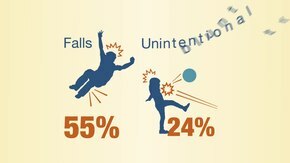 Young children have the highest concussion rate among all age groups. However, most people who suffer a concussion are young adults. A Canadian study found that the yearly incidence of MTBI is lower in older age groups (graph at right). Studies suggest males suffer MTBI at about twice the rate of their female counterparts. However, female athletes may be at a higher risk of suffering a concussion than their male counterparts. Up to five percent of sports injuries are concussions. The U.S. Centers for Disease Control and Prevention estimates that 300,000 sports-related concussions occur yearly in the U.S., but that number includes only athletes who lost consciousness. Since loss of consciousness is thought to occur in less than 10% of concussions, the CDC estimate is likely lower than the real number. Sports in which concussion is particularly common include football and boxing (a boxer aims to "knock out", i.e. give a mild traumatic brain injury to, the opponent). The injury is so common in the latter that several medical groups have called for a ban on the sport, including the American Academy of Neurology, the World Medical Association, and the medical associations of the UK, the US, Australia, and Canada. 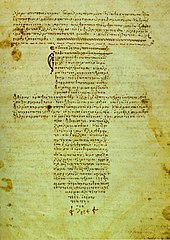 The Hippocratic Corpus, a collection of medical works from ancient Greece, mentions concussion, later translated to commotio cerebri, and discusses loss of speech, hearing and sight that can result from "commotion of the brain". This idea of disruption of mental function by "shaking of the brain" remained the widely accepted understanding of concussion until the 19th century. In the 10th century, the Persian physician Muhammad ibn Zakarīya Rāzi was the first to write about concussion as distinct from other types of head injury. He may have been the first to use the term "cerebral concussion", and his definition of the condition, a transient loss of function with no physical damage, set the stage for the medical understanding of the condition for centuries. In the 13th century, the physician Lanfranc of Milan's Chiurgia Magna described concussion as brain "commotion", also recognizing a difference between concussion and other types of traumatic brain injury (though many of his contemporaries did not), and discussing the transience of post-concussion symptoms as a result of temporary loss of function from the injury. In the 14th century, the surgeon Guy de Chauliac pointed out the relatively good prognosis of concussion as compared to more severe types of head trauma such as skull fractures and penetrating head trauma. In the 16th-century, the term "concussion" came into use, and symptoms such as confusion, lethargy, and memory problems were described. The 16th century physician Ambroise Paré used the term commotio cerebri, as well as "shaking of the brain", "commotion", and "concussion". Until the 17th century, a concussion was usually described by its clinical features, but after the invention of the microscope, more physicians began exploring underlying physical and structural mechanisms. However, the prevailing view in the 17th century was that the injury did not result from physical damage, and this view continued to be widely held throughout the 18th century. The word "concussion" was used at the time to describe the state of unconsciousness and other functional problems that resulted from the impact, rather than a physiological condition. In 1839, Guillaume Dupuytren described brain contusions, which involve many small hemorrhages, as contusio cerebri and showed the difference between unconsciousness associated with damage to the brain parenchyma and that due to concussion, without such injury. In 1941, animal experiments showed that no macroscopic damage occurs in concussion. The terms mild brain injury, mild traumatic brain injury (MTBI), mild head injury (MHI), and concussion may be used interchangeably; although the term "concussion" is still used in sports literature as interchangeable with "MHI" or "MTBI", the general clinical medical literature uses "MTBI" instead, since a 2003 CDC report outlined it as an important strategy. In this article, "concussion" and "MTBI" are used interchangeably. The term "concussion" is from Latin concutere, "to shake violently" or concussus, "action of striking together". Minocycline, lithium, and N-acetylcysteine show tentative success in animal models. ^ a b c "What are common TBI symptoms?". NICHD. Retrieved 18 December 2017. ^ a b c d e f g h i j k Mahooti, N (January 2018). "Sports-Related Concussion: Acute Management and Chronic Postconcussive Issues". Child and Adolescent Psychiatric Clinics of North America. 27 (1): 93–108. doi:10.1016/j.chc.2017.08.005. PMID 29157505. ^ a b c d e f g h i j k Cassidy JD, Carroll LJ, Peloso PM, Borg J, von Holst H, Holm L, et al. (2004). "Incidence, risk factors and prevention of mild traumatic brain injury: Results of the WHO Collaborating Centre Task Force on Mild Traumatic Brain Injury". Journal of Rehabilitation Medicine. 36 (Supplement 43): 28–60. doi:10.1080/16501960410023732. PMID 15083870. ^ a b c d e f g h i Ropper AH, Gorson KC (2007). "Clinical practice. Concussion". New England Journal of Medicine. 356 (2): 166–72. doi:10.1056/NEJMcp064645. PMC 2214550. PMID 17215534. ^ a b "What causes TBI?". www.nichd.nih.gov. Retrieved 18 December 2017. ^ a b c "How do health care providers diagnose traumatic brain injury (TBI)?". www.nichd.nih.gov. Retrieved 18 December 2017. ^ a b "What are the treatments for TBI?". www.nichd.nih.gov. Retrieved 18 December 2017. ^ "Traumatic Brain Injury (TBI): Condition Information". NICHD. Retrieved 18 December 2017. ^ a b c d e f g Halstead, ME; Walter, KD; Council on Sports Medicine and, Fitness. (September 2010). "American Academy of Pediatrics. Clinical report—sport-related concussion in children and adolescents". Pediatrics. 126 (3): 597–615. doi:10.1542/peds.2010-2005. PMID 20805152. ^ Halstead, ME; Walter, KD; Moffatt, K (12 November 2018). "Sport-Related Concussion in Children and Adolescents". Pediatrics. 142 (6): e20183074. doi:10.1542/peds.2018-3074. PMID 30420472. ^ "Traumatic Brain Injury". Merck Manuals Professional Edition. October 2013. Retrieved 18 December 2017. ^ "Sports-Related Concussion". Merck Manuals Consumer Version. Retrieved 18 December 2017. ^ Academies, Committee on Sports-Related Concussions in Youth, Board on Children, Youth, and Families, Robert Graham, Frederick P. Rivara, Morgan A. Ford, and Carol Mason Spicer, editors; Institute of Medicine and National Research Council of the National (2014). Sports-related concussions in youth : improving the science, changing the culture. National Academies Press. p. Chapter 5. ISBN 978-0-309-28800-2. Retrieved 18 December 2017. ^ a b c Kenneth Maiese (January 2008). "Concussion". The Merck Manual Home Health Handbook. ^ "Traumatic Brain Injury (TBI): Condition Information". nichd.nih.gov/. Retrieved 1 June 2018. ^ a b c Aubry M, Cantu R, Dvorak J, Graf-Baumann T, Johnston K, Kelly J, Lovell M, McCrory P, Meeuwisse W, Schamasch P, Concussion in Sport Group (2002). "Summary and agreement statement of the first International Conference on Concussion in Sport, Vienna 2001". British Journal of Sports Medicine. 36 (1): 6–10. doi:10.1136/bjsm.36.1.6. PMC 1724447. PMID 11867482. ^ a b c d e f Rees PM (2003). "Contemporary issues in mild traumatic brain injury". Archives of Physical Medicine and Rehabilitation. 84 (12): 1885–94. doi:10.1016/j.apmr.2003.03.001. PMID 14669199. ^ a b c d Comper P, Bisschop SM, Carnide N, Tricco A (2005). "A systematic review of treatments for mild traumatic brain injury". Brain Injury. 19 (11): 863–80. doi:10.1080/02699050400025042. ISSN 0269-9052. PMID 16296570. ^ a b c d e f g h i Kushner D (1998). "Mild Traumatic brain injury: Toward understanding manifestations and treatment". Archives of Internal Medicine. 158 (15): 1617–24. doi:10.1001/archinte.158.15.1617. PMID 9701095. ^ a b c d e f g Bowen AP (2003). "Second impact syndrome: A rare, catastrophic, preventable complication of concussion in young athletes". Journal of Emergency Nursing. 29 (3): 287–89. doi:10.1067/men.2003.90. PMID 12776088. ^ a b c Cantu RC (2001). "Posttraumatic Retrograde and Anterograde Amnesia: Pathophysiology and Implications in Grading and Safe Return to Play". Journal of Athletic Training. 36 (3): 244–48. PMC 155413. PMID 12937491. ^ a b Erlanger DM, Kutner KC, Barth JT, Barnes R (1999). "Neuropsychology of sports-related head enjury: Dementia pugilistica to post concussion syndrome". The Clinical Neuropsychologist. 13 (2): 193–209. doi:10.1076/clin.13.2.193.1963. PMID 10949160. ^ McCrory PR, Berkovic SF (1998). "Concussive convulsions. Incidence in sport and treatment recommendations". Sports Medicine. 25 (2): 131–36. doi:10.2165/00007256-199825020-00005. PMID 9519401. ^ Perron AD, Brady WJ, Huff JS (2001). "Concussive convulsions: Emergency department assessment and management of a frequently misunderstood entity". Academic Emergency Medicine. 8 (3): 296–98. doi:10.1111/j.1553-2712.2001.tb01312.x. PMID 11229957. ^ a b Cantu RC (2006). "An overview of concussion consensus statements since 2000" (PDF). Neurosurgical Focus. 21 (4:E3): 1–6. doi:10.3171/foc.2006.21.4.4. Archived from the original (PDF) on 2008-02-28. ^ Quality Standards Subcommittee of the American Academy of Neurology (1997). "Practice Parameter: The Management of Concussion in Sports (Summary Statement)" (PDF). American Academy of Neurology. pp. 1–7. Archived from the original (PDF) on 2008-02-28. Retrieved 2008-03-05. ^ a b Marcia K. Anderson; Susan Jean Hall; Malissa Martin (2004). Foundations of Athletic Training: Prevention, Assessment, and Management. Lippincott Williams & Wilkins. p. 236. ISBN 978-0-7817-5001-1. ^ a b Mayo Clinic Staff (2007). "Concussion". Mayo Clinic. Retrieved 2008-01-10. ^ a b c d e f g h Sivák Š, Kurča E, Jančovič D, Petriščák Š, Kučera P (2005). "Nácrt súcasného pohl'adu na problematiku l'ahkých poranení mozgu so zameraním na dospelú populáciu" [An outline of the current concepts of mild brain injury with emphasis on the adult population] (PDF). Časopis Lékařů Českých (in Slovak). 144 (7): 445–50. PMID 16161536. Archived from the original (PDF) on 2008-02-27. ^ Heegaard W, Biros M (2007). "Traumatic brain injury". Emergency Medicine Clinics of North America. 25 (3): 655–78, viii. doi:10.1016/j.emc.2007.07.001. PMID 17826211. ^ a b c d Pellman EJ, Viano DC (2006). "Concussion in professional football: Summary of the research conducted by the National Football League's Committee on Mild Traumatic Brain Injury" (PDF). Neurosurgical Focus. 21 (4): E12. doi:10.3171/foc.2006.21.4.13. PMID 17112190. Archived from the original (PDF) on 2008-02-28. ^ Shaw NA (2002). "The neurophysiology of concussion". Progress in Neurobiology. 67 (4): 281–344. doi:10.1016/S0301-0082(02)00018-7. PMID 12207973. ^ a b Poirier MP (2003). "Concussions: Assessment, management, and recommendations for return to activity". Clinical Pediatric Emergency Medicine. 4 (3): 179–85. doi:10.1016/S1522-8401(03)00061-2. ^ a b c d e f g h Anderson T, Heitger M, Macleod AD (2006). "Concussion and mild head injury" (PDF). Practical Neurology. 6 (6): 342–57. CiteSeerX 10.1.1.536.9655. doi:10.1136/jnnp.2006.106583. Archived from the original (PDF) on 2007-07-01. ^ Guskiewicz KM, Mihalik JP, Shankar V, et al. (2007). "Measurement of head impacts in collegiate football players: Relationship between head impact biomechanics and acute clinical outcome after concussion". Neurosurgery. 61 (6): 1244–52, discussion 1252–53. doi:10.1227/01.neu.0000306103.68635.1a. PMID 18162904. ^ a b c d Pearce JM (2007). "Observations on concussion. A review". European Neurology. 59 (3–4): 113–19. doi:10.1159/000111872. PMID 18057896. ^ Bigler ED (2008). "Neuropsychology and clinical neuroscience of persistent post-concussive syndrome". Journal of the International Neuropsychological Society. 14 (1): 1–22. doi:10.1017/S135561770808017X. PMID 18078527. ^ P Rousseau; A Post; T B Hoshizaki (2009). "The effects of impact management materials in ice hockey helmets on head injury criteria". Proceedings of the Institution of Mechanical Engineers, Part P: Journal of Sports Engineering and Technology. 223 (4): 159–65. doi:10.1243/17543371JSET36. ISSN 1754-3371. ^ Mouzon, B; Bachmeier, C (February 2014). "Chronic neuropathological and neurobehavioral changes in a repetitive mild traumatic brain injury model". Ann. Neurol. 75 (2): 241–54. doi:10.1002/ana.24064. PMID 24243523. ^ Smith, D; Johnson, V (April 2013). "Chronic neuropathologies of single and repetitive TBI: substrates of dementia?". Nat Rev Neurol. 9 (4): 211–21. doi:10.1038/nrneurol.2013.29. PMC 4513655. PMID 23458973. ^ McAllister TW, Sparling MB, Flashman LA, Saykin AJ (2001). "Neuroimaging findings in mild traumatic brain injury". Journal of Clinical and Experimental Neuropsychology. 23 (6): 775–91. doi:10.1076/jcen.23.6.775.1026. PMID 11910544. ^ a b c d e f g h i j Iverson GL (2005). "Outcome from mild traumatic brain injury". Current Opinion in Psychiatry. 18 (3): 301–17. doi:10.1097/01.yco.0000165601.29047.ae. PMID 16639155. ^ a b c Herring SA, Bergfeld JA, Boland A, Boyajian-O'Neil LA, Cantu RC, Hershman E, et al. (2005). "Concussion (mild traumatic brain injury) and the team physician: A consensus statement" (PDF). Medicine and Science in Sports and Exercise. 37 (11): 2012–16. doi:10.1249/01.mss.0000186726.18341.70. PMID 16286874. Archived from the original (PDF) on 2008-02-28. ^ Giza CC, Hovda DA (2001). "The Neurometabolic Cascade of Concussion". Journal of Athletic Training. 36 (3): 228–35. PMC 155411. PMID 12937489. ^ Hardman JM, Manoukian A (2002). "Pathology of head trauma". Neuroimaging Clinics of North America. 12 (2): 175–87, vii. doi:10.1016/S1052-5149(02)00009-6. PMID 12391630. ^ Mouzon (2017). "Lifelong behavioral and neuropathological consequences of repetitive mild traumatic brain injury". Annals of Clinical and Translational Neurology. 5 (1): 64–80. doi:10.1002/acn3.510. PMC 5771321. PMID 29376093. ^ a b c d e f g h i McCrory PR, Berkovic SF (2001). "Concussion: The history of clinical and pathophysiological concepts and misconceptions". Neurology. 57 (12): 2283–89. doi:10.1212/WNL.57.12.2283. PMID 11756611. ^ [dead link] Ontario Neurotrauma Foundation (June 2014). "Guidelines for Diagnosing and Managing Pediatric Concussion" (PDF). Archived from the original (PDF) on 8 August 2014. Retrieved 2 August 2014. ^ a b Cook RS, Schweer L, Shebesta KF, Hartjes K, Falcone RA (2006). "Mild traumatic brain injury in children: Just another bump on the head?". Journal of Trauma Nursing. 13 (2): 58–65. doi:10.1097/00043860-200604000-00007. PMID 16884134. ^ Kay A, Teasdale G (2001). "Head injury in the United Kingdom". World Journal of Surgery. 25 (9): 1210–20. doi:10.1007/s00268-001-0084-6. PMID 11571960. ^ a b c Borg J, Holm L, Cassidy JD, et al. (2004). "Diagnostic procedures in mild traumatic brain injury: Results of the WHO collaborating centre task force on mild traumatic brain injury". Journal of Rehabilitation Medicine. 36 (Supplement 43): 61–75. doi:10.1080/16501960410023822. PMID 15083871. ^ a b c d e f g h McCrory, P; Meeuwisse, W; Johnston, K; Dvorak, J; Aubry, M; Molloy, M; Cantu, R (Jul–Aug 2009). "Consensus statement on concussion in sport: the 3rd International Conference on Concussion in Sport held in Zurich, November 2008". Journal of Athletic Training. 44 (4): 434–48. doi:10.4085/1062-6050-44.4.434. PMC 2707064. PMID 19593427. ^ a b c d e Moser RS, Iverson GL, Echemendia RJ, Lovell MR, Schatz P, Webbe FM, et al. (2007). "Neuropsychological evaluation in the diagnosis and management of sports-related concussion". Archives of Clinical Neuropsychology. 22 (8): 909–16. doi:10.1016/j.acn.2007.09.004. PMID 17988831. ^ Maroon JC, Lovell MR, Norwig J, Podell K, Powell JW, Hartl R (2000). "Cerebral concussion in athletes: Evaluation and neuropsychological testing". Neurosurgery. 47 (3): 659–69, discussion 669–72. doi:10.1097/00006123-200009000-00027. PMID 10981754. ^ Randolph C (2011). "Baseline neuropsychological testing in managing sport-related concussion: does it modify risk?". Curr Sports Med Rep. 10 (1): 21–26. doi:10.1249/JSR.0b013e318207831d. PMID 21228656. ^ Binder LM (1986). "Persisting symptoms after mild head injury: A review of the postconcussive syndrome". Journal of Clinical and Experimental Neuropsychology. 8 (4): 323–46. doi:10.1080/01688638608401325. PMID 3091631. ^ "Press Announcements – FDA authorizes marketing of first blood test to aid in the evaluation of concussion in adults". www.fda.gov. Retrieved 24 February 2018. ^ a b Barth JT, Varney NR, Ruchinskas RA, Francis JP (1999). "Mild head injury: The new frontier in sports medicine". In Varney NR, Roberts RJ. The Evaluation and Treatment of Mild Traumatic Brain Injury. Hillsdale, New Jersey: Lawrence Erlbaum Associates. pp. 85–86. ISBN 978-0-8058-2394-3. ^ Delaney JS, Abuzeyad F, Correa JA, Foxford R (2005). "Recognition and characteristics of concussions in the emergency department population". Journal of Emergency Medicine. 29 (2): 189–97. doi:10.1016/j.jemermed.2005.01.020. PMID 16029831. ^ a b Bryant RA (2008). "Disentangling mild traumatic brain injury and stress reactions". New England Journal of Medicine. 358 (5): 525–27. doi:10.1056/NEJMe078235. PMID 18234757. ^ Satz P, Zaucha K, McCleary C, Light R, Asarnow R, Becker D (1997). "Mild head injury in children and adolescents: A review of studies (1970–1995)". Psychological Bulletin. 122 (2): 107–31. doi:10.1037/0033-2909.122.2.107. PMID 9283296. ^ Parkinson D (1999). "Concussion confusion". Critical Reviews in Neurosurgery. 9 (6): 335–39. doi:10.1007/s003290050153. ISSN 1433-0377. ^ Head Injury: Triage, Assessment, Investigation and Early Management of Head Injury in Infants, Children and Adults (PDF). National Institute for Health and Clinical Excellence. September 2007. ISBN 978-0-9549760-5-7. Retrieved 2008-01-26. ^ Ruff RM, Grant I (1999). "Postconcussional disorder: Background to DSM-IV and future considerations". In Varney NR, Roberts RJ. The Evaluation and Treatment of Mild Traumatic Brain Injury. Hillsdale, New Jersey: Lawrence Erlbaum Associates. p. 320. ISBN 978-0-8058-2394-3. ^ a b Cobb S, Battin B (2004). "Second-impact syndrome". The Journal of School Nursing. 20 (5): 262–67. doi:10.1177/10598405040200050401. PMID 15469376. ^ a b c d Petchprapai N, Winkelman C (2007). "Mild traumatic brain injury: determinants and subsequent quality of life. A review of the literature". Journal of Neuroscience Nursing. 39 (5): 260–72. doi:10.1097/01376517-200710000-00002. PMID 17966292. ^ Lee LK (2007). "Controversies in the sequelae of pediatric mild traumatic brain injury". Pediatric Emergency Care. 23 (8): 580–83. doi:10.1097/PEC.0b013e31813444ea. PMID 17726422. ^ a b Benton AL, Levin HS, Eisenberg HM (1989). Mild Head Injury. Oxford [Oxfordshire]: Oxford University Press. pp. v. ISBN 978-0-19-505301-2. ^ van der Naalt J (2001). "Prediction of outcome in mild to moderate head injury: A review". Journal of Clinical and Experimental Neuropsychology. 23 (6): 837–51. doi:10.1076/jcen.23.6.837.1018. PMID 11910548. ^ Savitsky EA, Votey SR (2000). "Current controversies in the management of minor pediatric head injuries". American Journal of Emergency Medicine. 18 (1): 96–101. doi:10.1016/S0735-6757(00)90060-3. PMID 10674544. ^ a b Parikh S, Koch M, Narayan RK (2007). "Traumatic brain injury". International Anesthesiology Clinics. 45 (3): 119–35. doi:10.1097/AIA.0b013e318078cfe7. PMID 17622833. ^ Larner AJ, Barker RJ, Scolding N, Rowe D (2005). The A–Z of Neurological Practice: a Guide to Clinical Neurology. Cambridge, UK: Cambridge University Press. p. 199. ISBN 978-0-521-62960-7. ^ McCrory P, Johnston K, Meeuwisse W, Aubry M, Cantu R, Dvorak J, Graf-Baumann T, Kelly J, Lovell M, Schamasch P (April 2005). "Summary and agreement statement of the 2nd International Conference on Concussion in Sport, Prague 2004". Br J Sports Med. 39 (4): 196–204. doi:10.1136/bjsm.2005.018614. PMC 1725173. PMID 15793085. ^ Levy ML, Ozgur BM, Berry C, Aryan HE, Apuzzo ML (2004). "Birth and evolution of the football helmet". Neurosurgery. 55 (3): 656–61, discussion 661–62. doi:10.1227/01.NEU.0000134599.01917.AA. PMID 15335433. ^ a b Willer B, Leddy JJ (2006). "Management of concussion and post-concussion syndrome". Current Treatment Options in Neurology. 8 (5): 415–26. doi:10.1007/s11940-006-0031-9. ISSN 1534-3138. PMID 16901381. ^ Reymond MA, Marbet G, Radü EW, Gratzl O (1992). "Aspirin as a risk factor for hemorrhage in patients with head injuries". Neurosurgical Review. 15 (1): 21–25. doi:10.1007/BF02352062. PMID 1584433. ^ Thornton K, Carmody D (2008). "Efficacy of traumatic brain injury rehabilitation: interventions of QEEG-guided biofeedback, computers, strategies, and medications" (PDF). Applied Psychophysiology and Biofeedback. 33 (2): 101–24. doi:10.1007/s10484-008-9056-z. PMID 18551365. ^ Anderson MK (2003). Fundamentals of sports injury management. Lippincott Williams & Wilkins. p. 79. ISBN 978-0-7817-3272-7. ^ Lumba-Brown, Angela; Yeates, Keith Owen; Sarmiento, Kelly; Breiding, Matthew J.; Haegerich, Tamara M.; Gioia, Gerard A.; Turner, Michael; Benzel, Edward C.; Suskauer, Stacy J.; Giza, Christopher C.; Joseph, Madeline; Broomand, Catherine; Weissman, Barbara; Gordon, Wayne; Wright, David W.; Moser, Rosemarie Scolaro; McAvoy, Karen; Ewing-Cobbs, Linda; Duhaime, Ann-Christine; Putukian, Margot; Holshouser, Barbara; Paulk, David; Wade, Shari L.; Herring, Stanley A.; Halstead, Mark; Keenan, Heather T.; Choe, Meeryo; Christian, Cindy W.; Guskiewicz, Kevin; Raksin, P. B.; Gregory, Andrew; Mucha, Anne; Taylor, H. Gerry; Callahan, James M.; DeWitt, John; Collins, Michael W.; Kirkwood, Michael W.; Ragheb, John; Ellenbogen, Richard G.; Spinks, Theodore J.; Ganiats, Theodore G.; Sabelhaus, Linda J.; Altenhofen, Katrina; Hoffman, Rosanne; Getchius, Tom; Gronseth, Gary; Donnell, Zoe; O’Connor, Robert E.; Timmons, Shelly D. (4 September 2018). "Centers for Disease Control and Prevention Guideline on the Diagnosis and Management of Mild Traumatic Brain Injury Among Children". JAMA Pediatrics. 172 (11): e182853. doi:10.1001/jamapediatrics.2018.2853. PMID 30193284. ^ Murray ED, Buttner N, Price BH (2012). "Depression and Psychosis in Neurological Practice". In Bradley WG, Daroff RB, Fenichel GM, Jankovic J. Bradley's neurology in clinical practice. 1 (6th ed.). Philadelphia, PA: Elsevier/Saunders. p. 111. ISBN 978-1-4377-0434-1. ^ Alexander MP (1995). "Mild traumatic brain injury: Pathophysiology, natural history, and clinical management". Neurology. 45 (7): 1253–60. doi:10.1212/WNL.45.7.1253. PMID 7617178. ^ Hall RC, Hall RC, Chapman MJ (2005). "Definition, diagnosis, and forensic implications of postconcussional syndrome". Psychosomatics. 46 (3): 195–202. doi:10.1176/appi.psy.46.3.195. PMID 15883140. ^ a b c d e f g h Masferrer R, Masferrer M, Prendergast V, Harrington TR (2000). "Grading scale for cerebral concussions". BNI Quarterly. 16 (1). ISSN 0894-5799. ^ Schulz MR, Marshall SW, Mueller FO, et al. (November 2004). "Incidence and risk factors for concussion in high school athletes, North Carolina, 1996–1999". American Journal of Epidemiology. 160 (10): 937–44. doi:10.1093/aje/kwh304. PMID 15522850. ^ De Beaumont, Louis; Theoret, Hugo; Mongeon, David; Messier, Julie; Leclerc, Suzanne; Tremblay, Sebastien; Ellemberg, Dave; Lassonde, Maryse (2009). "Brain function decline in healthy retired athletes who sustained their last sports concussion in early adulthood". Brain. 132 (Pt 3): 695–708. doi:10.1093/brain/awn347. PMID 19176544. ^ a b Ryan LM, Warden DL (2003). "Post concussion syndrome". International Review of Psychiatry. 15 (4): 310–16. doi:10.1080/09540260310001606692. PMID 15276952. ^ Zemek, RL; Farion, KJ; Sampson, M; McGahern, C (1 March 2013). "Prognosticators of persistent symptoms following pediatric concussion: a systematic review". JAMA Pediatrics. 167 (3): 259–65. doi:10.1001/2013.jamapediatrics.216. PMID 23303474. ^ Boake C, McCauley SR, Levin HS, Pedroza C, Contant CF, Song JX, et al. (2005). "Diagnostic criteria for postconcussional syndrome after mild to moderate traumatic brain injury". Journal of Neuropsychiatry and Clinical Neurosciences. 17 (3): 350–56. doi:10.1176/appi.neuropsych.17.3.350. PMID 16179657. Archived from the original on 2006-10-06. ^ Alice Klein (Nov 11, 2017). "Pure oxygen can help concussion". New Scientist. ^ Wiley (Dec 14, 2017). "Lifelong behavioral and neuropathological consequences of repetitive mild trauma". ScienceDaily. ^ Harmon KG (1999). "Assessment and management of concussion in sports". American Family Physician. 60 (3): 887–92, 894. PMID 10498114. ^ a b Cantu RC (2007). "Chronic traumatic encephalopathy in the National Football League". Neurosurgery. 61 (2): 223–25. doi:10.1227/01.NEU.0000255514.73967.90. PMID 17762733. ^ McCrory P (2001). "Does second impact syndrome exist?". Clinical Journal of Sport Medicine. 11 (3): 144–49. doi:10.1097/00042752-200107000-00004. PMID 11495318. ^ a b Gordon KE, Dooley JM, Wood EP (2006). "Descriptive epidemiology of concussion". Pediatric Neurology. 34 (5): 376–78. doi:10.1016/j.pediatrneurol.2005.09.007. PMID 16647998. ^ McKeever CK, Schatz P (2003). "Current issues in the identification, assessment, and management of concussions in sports-related injuries". Applied Neuropsychology. 10 (1): 4–11. doi:10.1207/S15324826AN1001_2. PMID 12734070. ^ a b Langlois JA, Rutland-Brown W, Wald MM (2006). "The epidemiology and impact of traumatic brain injury: A brief overview". Journal of Head Trauma Rehabilitation. 21 (5): 375–78. doi:10.1097/00001199-200609000-00001. PMID 16983222. ^ Cantu RC (1998). "Second-impact syndrome". Clinics in Sports Medicine. 17 (1): 37–44. doi:10.1016/S0278-5919(05)70059-4. PMID 9475969. ^ Solomon GS, Johnston KM, Lovell MR (2006). The Heads-up on Sport Concussion. Champaign, IL: Human Kinetics Pub. p. 77. ISBN 978-0-7360-6008-0. ^ Denny-Brown D, Russell WR (1940). "Experimental cerebral concussion". Journal of Physiology. 99 (1): 153. PMC 1394062. PMID 16995229. ^ a b Borg J, Holm L, Peloso PM, Cassidy JD, Carroll LJ, von Holst H, et al. (2004). "Non-surgical intervention and cost for mild traumatic brain injury: Results of the WHO Collaborating Centre Task Force on Mild Traumatic Brain Injury". Journal of Rehabilitation Medicine. 36 (Supplement 43): 76–83. doi:10.1080/16501960410023840. PMID 15083872. ^ Kraus JF, Chu LD (2005). "Epidemiology". In Silver JM, McAllister TW, Yudofsky SC. Textbook of Traumatic Brain Injury. American Psychiatric Pub., Inc. p. 23. ISBN 978-1-58562-105-7. ^ National Center for Injury Prevention and Control (2003). "Report to congress on mild traumatic brain injury in the United States: Steps to prevent a serious public health problem" (PDF). Atlanta, GA: Centers for Disease Control and Prevention. Archived from the original (PDF) on 2008-02-28. Retrieved 2008-01-19. ^ Brooks D, Hunt B (2006). "Current concepts in concussion diagnosis and management in sports: A clinical review". BC Medical Journal. 48 (9): 453–59. ^ Toledo, E; Lebel, A; Becerra, L; Minster, A; Linnman, C; Maleki, N; Dodick, DW; Borsook, D (Jul 2012). "The young brain and concussion: imaging as a biomarker for diagnosis and prognosis". Neuroscience and Biobehavioral Reviews. 36 (6): 1510–31. doi:10.1016/j.neubiorev.2012.03.007. PMC 3372677. PMID 22476089.